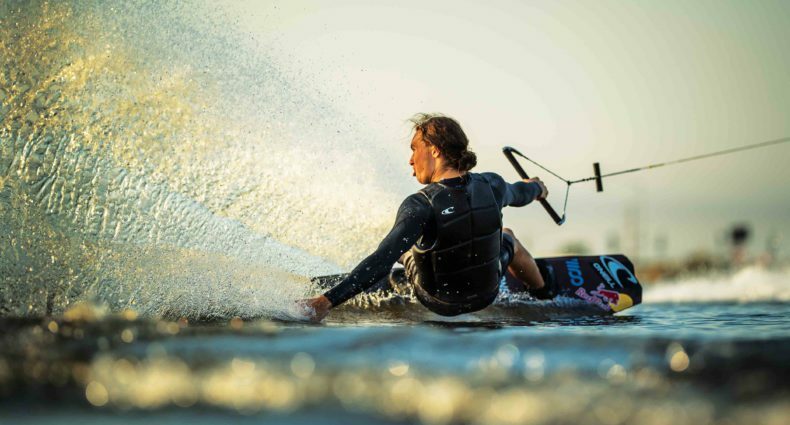 The second day of the 2015 WWA Wake Park World Championships brings together both traditional park riders and features only athletes at Al Forsan International Sports Resort. Abu Dhabi, November 5th 2015 – The world’s best park riders from all age groups and divisions battled it out in several different categories throughout the day. With both cables spinning, professional and amateur wakeboarders and wakeskaters all got out on the water today. 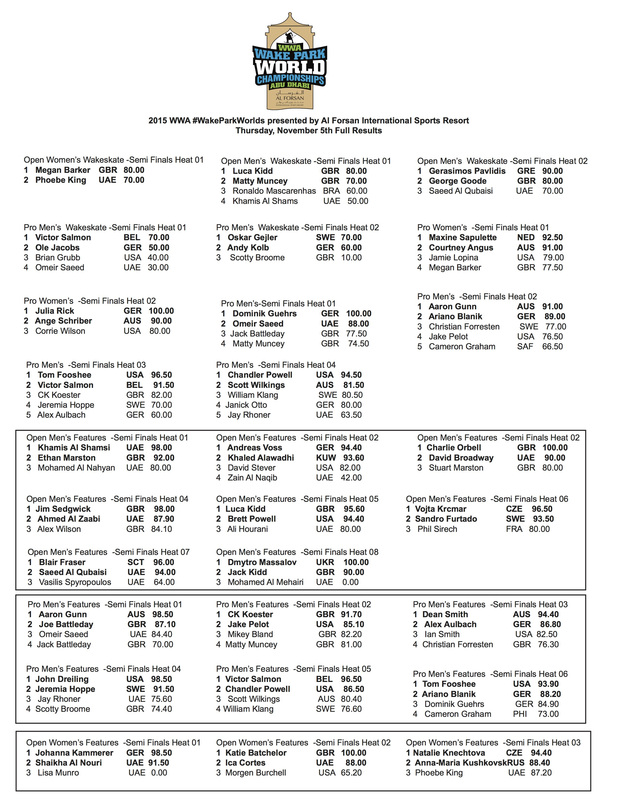 The 2015 WWA Wake Park World Championships furthered its path on the way to crowning the new professional World Champions in both traditional cable and features only. Following today’s riding, there were also two new champions crowned for men and women’s Big Air Kicker competition, plus the highly acclaimed “most fun” division- go-karting. Wakeskating was the first event out on the cable this morning, kicking off with the Open Women, Open Men and wrapping up with Professional Men. 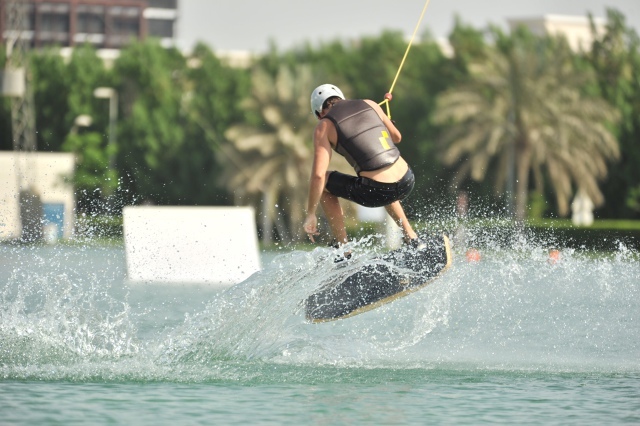 With two complete full size cables at Al Forsan, the wakeskaters were able to utilize the smaller cable with a more “skater” friendly course. The Open Women’s division watched Megan Barker (GBR) slay the skate lake to win her heat. Open Men’s Wakeskate gave the professionals a great idea of who and what they will be watching out for in the very near future. Greece brought some topnotch representation with Gerasimos Pavlidis and his perfect 3-shuv. The Professional Men Wakeskaters finished off riding for the day on the counter clockwise cable with some of the most electrifying action to be seen during a wakeskate event. Victor Salmon of Belgium really showed off his skills with a stand up, flawless run, which resulted in winning his semi-final heat. The semi finals for Professional Men turned it up to a whole new level in the traditional category as soon as they hit the water. These riders were using every bit of the entire course on the clockwise cable. With a total of 9 features to hit, along with packing tricks in the flats anywhere they could, these riders really showed the world how to ride a wake park to the fullest extent. The action was as thrilling as ever as riders were giving us final round quality performances this early in the event. “Its anybody’s game here. You have to ride like your riding in a final every round now due to the tough level of riding”, said local UAE rider Omeir Saeed. Saeed kept the Emiratis proud by making it through to tomorrow’s top eight head-to-head final. As the sun began to set, the time for the features only divisions of Open Men, Open Women and Professional Men. The jam style format gave the crowd everything they could ever hope to see at a wake park event. Riders were throwing their best possible tricks on each section/feature of the park. The Open Men’s division was said to be as close as it ever has been compared to Professional Men in terms of the level of tricks performed. This division also was extremely competitive as it contained the largest amount of riders out of any division. Highlights included Luca Kidd’s rail hits and Brett Powell’s kicker hits, which included a switch heelside 9. The Professional Men’s division brought out the bangers nice and early as it became apparently needed to advance through to the final day. Double-flips, grabbed backside 9’s and a wild mix of mobes were all happening on the regular, along with the most technically advanced and stylish presses on the rails. Come tomorrow we will have a new set of World Champions for 2015 here at Al Forsan International Sports Resort. Day 2 ended with what some call the “most competitive” division of the entire event. The go-karting grand prix on Al Forsan’s world famous track got as fierce as ever as riders were posting personal record fast times, and displayed some very advance strategies in passing each other. It was Brian Grubb that took the title of WWA Wake Park World Champion in the Grand Prix of Go-Karting. the coveted title of WWA Wake Park World Champion. If you live in the UAE, be sure to head out to Al Forsan International Sports Resort for the final day of intense competition. If you don’t live here, check the WWA’s twitter account (@theWWA) for all results as soon as they are published.